It was a chilly, overcast morning to kick off a special day at St. George Tennis...the opening of our new Tennis Courts! The dreary weather, however, did not put a damper on the spirits of the dedicated volunteers, supporters, players and parents that have helped make the dream possible. After a steady crowd began to trickle in, we knew it was going to be a special day, indeed. Coach Dion Straub officially began the program by welcoming everyone to the Tennis Center and thanking them for joining us on the special occassion. We were fortunate to have Pastor David Drumheller, also a member of the Adult League Committee, give a warm invocation to start our day. Pastor Drumheller introduced Chairman of the SGYSL Board, Ian Jones to give a special message. Mr. Jones reminded everyone of how much our tennis program has accomplished over the years and then recited a past 'Letter to the Editor' that spoke of how The St George Sports Complex was an amazing venture that could only come together through the support and unity of our community. The reading of this letter served as a segway into the next speaker for our program, Vice Chairman, Daniel Walters. He was glad to give a recap of what the program had accomplished within the past year, in both the junior and adult divisions. He also spoke of how the courts were vital to our program's continued growth and prosperity, explaining why our community needed these courts to be built and thanking the many people who helped to accomplish this goal. Mr. Walters explained to the crowd how our program would not have been possible without the constant support and motivation of the United States Tennis Association and how it was a great pleasure to have two USTA representatives at our program: Mr. Steve Zalinsky, Tennis Service Representative for USTA Southern, and Mr. Al Marshall, President of the USTA South Carolina Board of Directors. our state. He sees the revival of our old courts, addition of five new courts and start of our tennis program, as nothing short of 'phenomenal.' Mr. Marshall stated that the dedication of so many volunteers and support from our community officials and organizations has set an impressive example for other communities in South Carolina. Mr. Marshall said that, "USTA SC is proud to be a part of this endeavor." Next to speak in our program was our "Godmother of Tennis" and Executive Director of our program, Mrs. Barbara Jones. 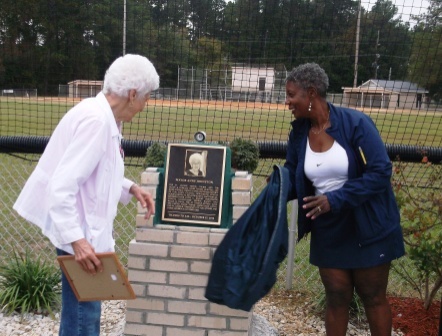 She was excited to be able to present the Dedication Plaque at the entrance to our courts and especially excited that the plaque was placed in honor of one of our greatest supporters, Mayor Anne Johnston. Mrs. Barbara spoke a few encouraging words about our accomplishments, recognized the many supporters in attendance, and then read the words inscribed on the plaque. Mrs. Jones then called for Mayor Anne to come up to the podium. There, the plaque was unveiled and to the Mayor's surprise, was dedicated to her! Mayor Johnston was overwhelmed by the show of gratitude and was honored to have the permanent marker of recognition. She took the mic and thanked everyone for their part in making a place that the community can be proud of. She reaffirmed that with unity, dedication and community support, we can accomplish great things! 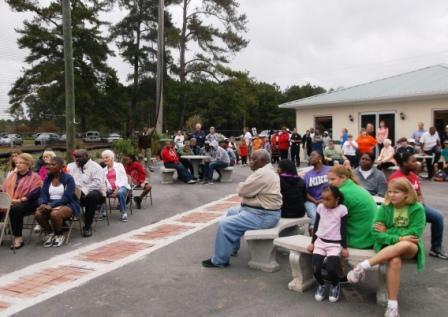 Immediately following the program, Mrs. Barbara officially opened the courts to the public and the 3rd Annual Pumpkin Match Tournament began. 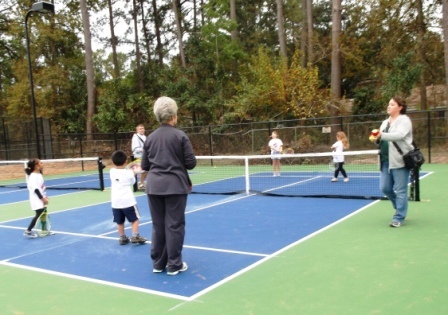 The new Quickstart Tennis courts were a big hit!